Mold needs three things to grow: oxygen, a food source and moisture. Remove one of those from the mix and mold won’t grow. We’re not going to eliminate oxygen in the air, nor can we get rid of the food source, since mold loves to grow on wood. Instead, we’ve been concentrating our efforts on finding ways to keep moisture out of the wood using best practices for storage and chemical preventive treatments. Often, how the pallet is stored can keep mold from forming. 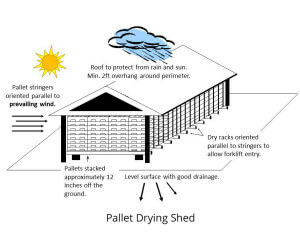 This pallet drying shed illustrate different techniques for keeping pallets dry and free of mold. PalletOne keeps its non-chemical, mold-free pallets under roof from the time they are built through their delivery to the customer’s site in a van that keeps the rain out during transit. 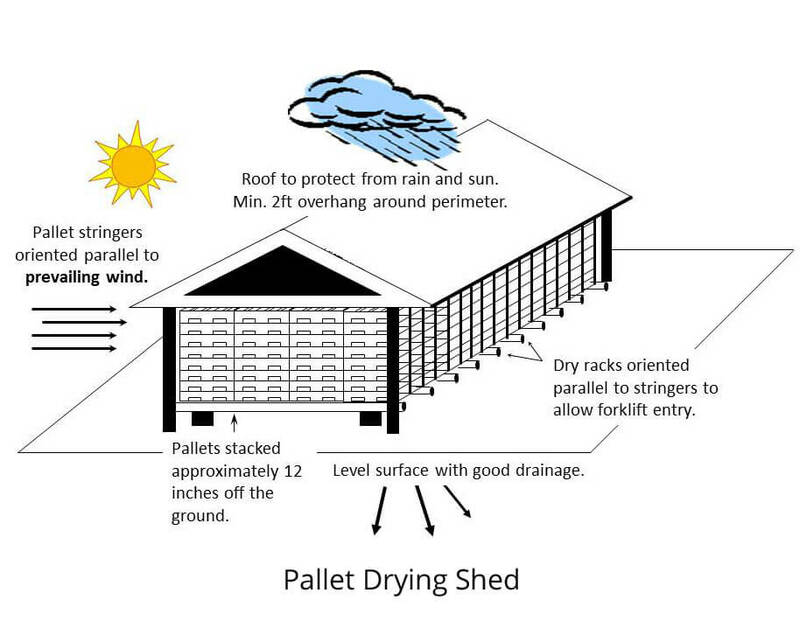 Duvall recommends that customers store the pallets in a dry, covered spot and rotate them on a first-in, first-out basis. Make sure there’s good circulation in the storage building; some companies store pallets in fan sheds that help keep the air moving. Finally, remember that mold spores are everywhere in the air and given the right conditions, such as a moist environment, they will land on the wood pallets and start growing. Don’t keep pallets besides a dumpster or a trash can, in a room where there are wet mops and buckets or in a rarely-used space that contains old items that could be harboring mold spores. These storage strategies can go a fair distance in preventing the growth of mold, but may have limited effectiveness in some situations. Summertime humidity in some areas of the country, for example, makes it difficult to keep the moisture out of the wood. In the next blog we’ll look at how chemical treatments can help improve outcomes. Wibke Duvall works as a Special Projects Analyst for PalletOne. She earned her Master’s Degree in Wood Science through a collaboration with one of the nation’s top programs, Virginia Polytechnic Institute, and the University of Hamburg. 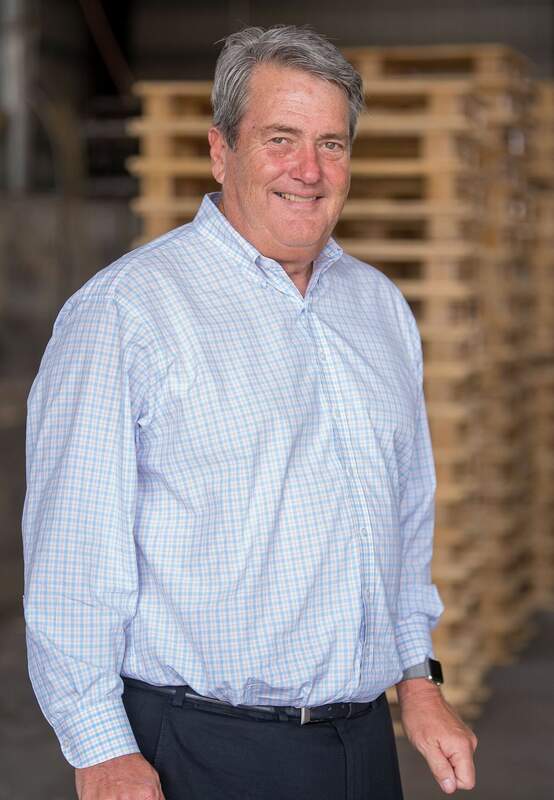 Wibke’s high level of scientific knowledge of the physical, material and structural properties of wood is unique to the pallet manufacturing industry. Wibke worked 5 years as the Plant Manager in one of PalletOne’s largest production facilities learning about the pallet industry, design, production and assembly. She then advanced to focus solely on unit load design for PalletOne customers seeking to reduce their supply chain costs. As an expert in both Best Load™ and PDS™, Wibke uses in-depth analysis of the interactions between the pallet, packaging and material handling equipment to deliver substantial savings to our customers in a variety of areas including product damage, warehouse safety, storage and shipping efficiency. As special project analyst, Wibke consults with customers seeking to resolve unique supply chain related issues as well as staying at the forefront of pallet industry and wood related scientific and technological advancements that reduce cost and improve safety throughout the supply chain.